For the first time in the history of the Institution our continental visit was starting from Waterloo and would take the Eurostar to Brussels. Our train which was to take us through the Channel Tunnel was booked to depart from Waterloo International at 12.14 and should take just 3 hours 30 minutes. Although we were not using the Channel ferry on this journey, there would be two other ferries encountered during the course of our journey to Gothenburg. Our party consisted of 18 members and 2 wives, 14 of whom met at Waterloo at 11.30, the remaining six being members from Germany who we will meet in Gothenburg. After the check in at Waterloo International, time was available for a coffee and money changing before boarding our train. Swedish and Danish currency was not available at the bureau de change so this would have to wait until our arrival in Copenhagen. Departure from Waterloo was 5 minutes late due, it was thought, to a problematic door on the train; once under way however we were routed out via Peckham Rye as far as Shortlands Jct returning there to Channel Train Route One route via Tonbridge, it being noted that we had taken 25 minutes to cover the first 10 miles out of London. We called briefly at Ashford International before heading for the tunnel, transit of which was swift and once out on the French side and on the high speed line, speed rose rapidly towards line speed. After Lille International we turned off the Paris route and headed for Brussels. In the last few miles of our journey a large amount of work on the Belgian high-speed line was noted. Arrival in Brussels was on time and there was now a break of two hours before the 18.47 departure for Copenhagen, this time being put to good use in obtaining something to eat. After boarding our train and finding our couchettes, the party settled down to watch the scenery as we headed towards Germany. The Belgian system of bi-directional signalling was noted, it is so far as I am aware universal. The signals appertaining to wrong road operation flash continuously to remind the driver that he is running wrong road. We arrived at Aachen on the Belgian/German border at 21.54 and, if memory serves me correctly, the section from Paris was joined to our train here. At Koln we had a fine view of the imposing cathedral which rises up majestically from behind the station. After Koln our route took us through Duisburg, Essen, Osnabruck, Bremen, Hamburg 02.30/02.40, Iubeck and we arrived at Puttgarden at 04.45 approx. At Puttgarden our train was loaded aboard the ferry for the 30 min voyage to the Danish side of the Baltic sea at Rodby. The shunting and rattling of tie down chains roused me from my slumbers. These were disturbed again a short while later when our passports were returned and then yet again after arrival in Rodby when the Danish customs came round to check our passports. Finally at about 06.25 we set off behind loco no. 1528, a DSB diesel and a return to sleep was possible. Our arrival in Copenhagen was on time at 08.28 and we now had to locate our train, the 09.05 to Hassleholm. Presenting ourselves at the correct platform, I enquired of a D.S.B. conductor, who stood nearby, as to whether we would require reservations for this train (having been forewarned that something may be required), this was confirmed in the positive but I was relieved to be told that these could be obtained on the train. Seat reservations are required on nearly all trains in the Scandinavian countries. Our train was, a three car IC3 set of Danish origin but this set belonged to SJ. These are quite impressive and unmistakable DMU's, the end corridor connection being a large rubber doughnut, which is fitted around the body end edge; it would appear that this is inflated after attaching to another unit and the front door and central driving desk is swung put of the way. Internally, they are very comfortable with large well-spaced seats and floor carpeting, which is carried up the bodyside to window level. They are also very quiet and smooth when running. Our journey to Helsingor took just under one hour and on arrival the train bypassed the terminal station and instead ran straight on to the ferry on the centre track, cars and lorries etc. being loaded on either side. The ferry trip took 20 minutes and on our arrival at Helsingborg both train and road vehicles departed the ferry together. Both loading and unloading were carried out with great efficiency, our party being deposited on Helsingborg platform at 10.40. In the time now available before our departure for Gothenburg, seat reservations at 3 each were obtained. Our train to Gothenburg departed at 11.39, the train formation consisting of one of the RC series electric locomotives, four coaches and a van. Our journey of 2 hours 51 mins took us through scenery which changed from flatlands to hill and wooded country and back to flatlands. The weather also varied considerably with rain at Bastad changing later to bright cloudless skies. An interesting feature seen since arrival in Denmark and through Sweden was the large-scale use of wind farms for electricity production. These usually consisted of about 3-4 wind turbines but at Vanberg I counted 13 turbines; I did wonder how much electricity is produced by such a farm. Another notable feature of the journey to Gothenburg was the large amount of double tracking and route realignment taking place. In some places the realignments are considerable and it would appear that some stations will close as a result. Arrival in Gothenburg at 14.30 was on time and for the third time in 60 years a party from the Locomotive & Carriage Institution checked in at the Eggers hotel, which is immediately outside the station. Check in was swift and simple and we established that four of our members from Germany had arrived at about midday and were out seeing the sights. The final two German members were expected at around 18.00, they had been on a two week cycle tour around Denmark before joining us for the week in Sweden. I should now explain that at this point no arrangements for visits had been confirmed because my letter to SJ requesting some visit arrangements had gone unanswered, phone calls to SJ had been made before departure from the UK and it was indicated by them that I would receive a letter from the SJ technical department; this was not forthcoming. With this problem facing me the chairman and I went across to the station to see if we could make contact with local management and make some arrangements to visit facilities in the Gothenburg area. We had no success in this and at 16.30 decided that time was probably against us. After a drink in the station cafe we returned to the hotel to meet the members at 18.00 and to inform them of the situation. After this meeting we broke up for the evening. Five members had caught the 06.35 to Oslo to spend a day in the Norwegian capital, other less energetic folk took advantage of the free day to lay in before heading out to see the sights. After breakfast the chairman and I returned to the station to continue the search for the management offices and hopefully to put in place some arrangements for our members benefit. Plans to try and arrange a visit to Adtranz in Vasteras had to be abandoned because of travel problems. At about 10.30, after a fruitless search for anyone who might be able to help us with our problem, Roy Crocker appeared wearing a large smile, and brandishing a card, informed me that I was to contact Anne Ostensson (the name on the card). It transpired that my original letter to SJ had just reached Ms Ostensson's desk this morning, she had contacted the hotel and as luck would have it, found Roy still in. A railway policeman directed the three of us to an information office which for some reason both David and I had missed during our searches. A guide was provided to Ms Ostensson's office. Following introductions and coffee our requests as outlined in my letter were discussed and a programme formulated, a copy of which was to be deposited with the hotel on Wednesday. We were also able to talk briefly about privatisation and it would appear that -SJ and its staff are facing problems that are familiar to all of us. The three of us thanked Ms Ostensson and departed, Roy noting that I now looked some 10 years younger than an hour ago; indeed a great weight had been lifted from my shoulders. We now set off to see some of the sights and to explore the backwaters of Gothenburg. As previously arranged, all of the available members met in the hotel reception at 18.00 when I was then able to provide outline details of the depot and control centre visit arranged for Thursday and the lecture that would be presented on Friday afternoon on the X2000 project. The members who had spent the day in Oslo were met on arrival back in Gothenburg and also informed of the arrangements made for Thursday and Friday. After this I was able to retire f or a well-earned rest. After the breakfast formalities a large group of us set out to catch the 08.05 X2000 to Stockholm; other members (the Oslo group) opting to visit Trollhattan and the impressive locks at this location, and also maintaining an Institution tradition of visiting Trollhattan on each visit to Sweden. 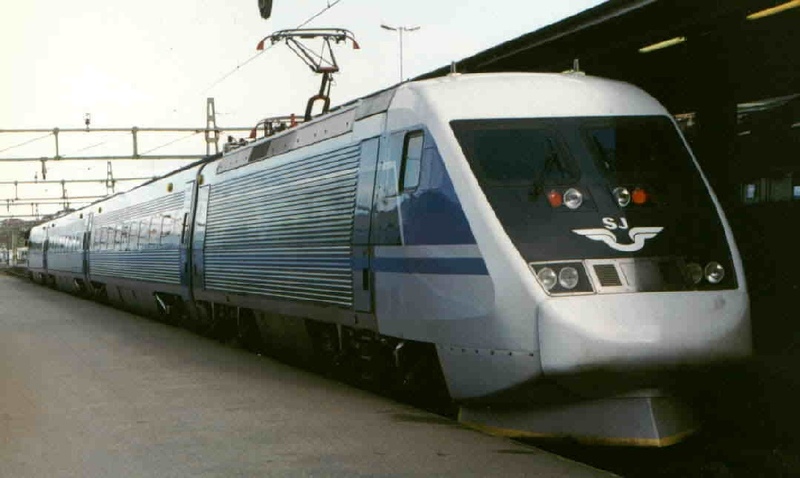 The X2000 or class X2 as it is properly known is an impressive train, which as we were to learn on Friday was developed over a long period of time to address the severe loss of passenger business on Sweden's railways. The final product is a tribute to the time and effort put in by SJ and the, railway industry in the development of the X2 and to say it has been well received by the travelling public is an understatement. The X2 sets are made up of six coaches and a power car, the power car being at the Gothenburg end of the train in all cases. The interiors are well appointed with wide seats, which are fitted with adjustable backrests and a generous amount of leg room. Of particular interest however was the tilt, how it would feel and what sort of effects it might have on the body, (the human ones), tales of sea sickness as experienced by some on B.R. 's A.P.T. were recalled. Once underway, however, it soon became apparent that the tilting was hardly noticeable except when you looked for it. Running alongside a lake at low speed did give a full impression of what tilting was like when at one moment we were looking at water and in the next the sky. The transition from looking down to looking up was slower than you would expect when compared to a ship in a heavy swell. Travelling at speeds up to 100 m.p.h. (approx) the transition into and out of curves was little different to that which may be experienced when leaning into a curve with a high degree of cant. The journey was fast and uneventful and as smooth as silk, even the braking was noticeably smooth. On arrival in Stockholm our group split up into two sections, one group disappearing and not to be seen for the rest of the day, our group decided to go in search of a vintage tram ride, which the tourist office informed us was operating. On arrival at the terminus it was obvious it wasn't. Our walk to the tram terminus had taken us past the Royal Palace and Parliament buildings and also the Opera House; this was considered some consolation. As it was now well into the lunch hour, we decided to take refreshment in the Berns Salonger a grand cafe/theatre, very highly decorated with wood panelled walls, moulded ceilings and some most impressive chandeliers. The whole building dated back to 1855 and was opened so that theatre goers could have a drink, an activity then frowned upon whilst out at the theatre. After lunch our tour of Stockholm continued, though two members departed our group at this time as they were booked back on the later 17.00 X2, four of us returning on the 16.06 InterCity. The four of us remaining walked back to the station via some of Stockholm’s back streets in which we saw some very ugly buildings of both new and old construction. Arrival back at Stockholm central station was in plenty of time for our train, so this gave us time to look around the impressive station hall before going to our platform for the 16.06 to Gothenburg. An RC 6 ‘ electric locomotive No. 1353 and approx 6 coaches headed this train. Departure was on time but not from the advertised platform. The principal reason for the four of us using this train instead of the 17 or 19.30 X2s was simply a matter of economics, the X2 reservation fee is 10 and on an InterCity 3. Being able to observe the lineside and station activity more closely compensated the longer journey time of 4 hrs 34, as against the 3 hr 12 min of the 17.00 X2. At some stations we had time to get down and walk around, if only briefly. The rear conductor of our train was a lady who had spent some 20 years, in the merchant navy and knew London well. She was quite chatty, informing us that the Gothenburg canal was known as the divorce ditch because of its up and down nature. At the point our train crossed the Gothenburg canal we were able to observe single line working over double track, using reversible signalling; there was a block on the canal bridge on the Gothenburg direction track. At Herrljunga we had to wait for the 17.00 ex Stockholm X2 to pass. During this wait our conductor introduced us to the driver of a local train, she in turn invited us to join her on her journey but on being informed that dinner would be bread and cheese we declined the offer. Throughout our return journey to Gothenburg we noticed a high level of goods traffic mainly headed north, the goods trains appeared to be in the order of 1000-1500 tons each. Despite some late running, caused mainly by the P.way slowing over the Gothenburg canal, but also by an earlier failure in the Hallsberg control centre, our arrival in Gothenburg at 20.40 was on time. On returning to the hotel I was handed a letter from SJ with full details of arrangements for Thursday and Friday. Our party assembled in the hotel reception at around 10.15 for the short walk to platform 8 and to meet Anne Ostensson who was to act as our guide for the day. An empty EMU of class X10B was waiting to take us on the short journey into Olskroken depot, where we were met by Mr Rolf Torwold the depot manager who conducted us to a conference room. After welcoming our party to Olskroken depot Mr Torwold gave a brief outline of the depot's activities. Olskroken opened in 1986 and up to 1996 has been rebuilt three times. Total depot staff stands at 250 with 60 or more people on duty at any one time. The depot's activities are controlled from the order central office located within the depot. This office issues instructions for daily maintenance on X2 units and rolling stock and will also pass on messages from incoming trains that may need attention. The 11,000 km SJ system is 90% electric so there are no facilities at Olskroken for diesel locomotives or units. Graffiti is a recurring problem as is damage from wheel slide on EMU's coaches. EMU's are fitted with disk and magnetic brakes, but no sanders; problems similar to those experienced by B.R. in the leaf fall season are just as great in Sweden. After a spell of questions and answers we moved into the depot to see the facilities. The depot is laid out as a through building with, if memory serves me correctly, 6 roads of which only one has a high level platform for use mainly by cleaners. Three central roads have lifts available for body side attention and overhead floors are provided for roof and pantograph work to be carried out from. Wheel drops are provided and body lifting can be carried out on the two inner most roads. There are also sections of solid catenary, which can be swung out of the way for overhead cranes to operate in. Workshops are provided for carrying plumbing repairs and woodworking. During our tour of the depot many questions were raised and ably answered by our guides. On completing the tour we returned to the conference room for a very welcome lunch. Following lunch a meeting had been arranged with people from the drivers, safety and technique and planning departments. The first speaker Mr Jarl Samuelsson the driver manager for the Gothenburg region, gave details of some of the conditions and training requirements for the 270 drivers under his control. Driver training takes 14 months with five months being spent on rules training; the rules training is carried out in Mjoesy. The minimum age at which driver training starts is 21 and retirement is usually at 60 years of age, though drivers can carry on until the age of 70. At the end of the 14 months the new driver will be qualified on all classes of train and traction except the X2 which requires a further 4 weeks handling experience. Rosters are based on a 12 week cycle with rostered hours from 4 to 14 hours per day and a maximum of 5 hours driving before a break is taken. The usual continental pattern of rostering is adopted i.e. a different job and booking on time each day. 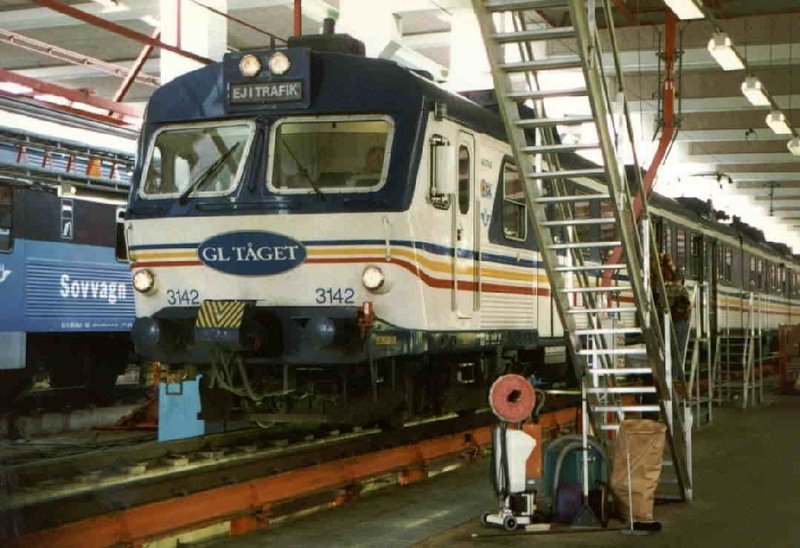 Routes covered by Gothenburg drivers include Stockholm, Malmo and Oslo, extra training in Norwegian rules and signalling being required for working to Oslo. Mr Arne Jonsson presented the talk on safety and technique and here I have to confess to being short of notes as Mr Jonsson was difficult to keep up with, however I did manage to note that drivers are re-examined every year and that driver ride outs take place every two years. Also at two yearly intervals is a two-hour course on dangerous goods. Mr Ake Gillman explained that the Transport and Planning dept had been set up in response to the governments deregulation of Banverket, the Swedish version of Railtrack in 1994 and thus opening up the system to other potential train operators. There are already some small freight and passenger operators starting either new services or taking over the operation of minor lines. Also noted during this lecture was the way ownership of rolling stock is now being spread out, with ADtranz owning the X2 sets; X10-14 EMU's being locally owned in some cases and locomotives and coaches being under ownership of either SJs passenger or freight businesses. This had been a very interesting and informative series of short lectures with questions put by our members ably answered. We left Olskroken depot as we arrived on a special ECS working to take us back to Gothenburg station and a ten minute walk to the traffic control centre which is located at the far or country end of the station carriage sidings. On arrival at the control centre Ms Ostensson introduced us to Mr Lars Gustavsson of SJ and Mr Lars Elner of Banverket who gave us a brief lecture on the control centre. The centre controls some 800-1000 km and is operated on the CTC system (centralised traffic control). The centre which was first opened in 1975 (and visited by the Institution in 1976) was at present undergoing rebuilding and extension work, with new panels and spare capacity being added. This work has involved moving the control desks out into a hallway whilst an extension was added and then moved back into the enlarged control room. There is a track diagram around the wall which gives an overall view of train 'movements to signalman and controllers. Each of the eight signalmen keeps an eye on his particular patch via a monitor screen in front of him. During the day the control room is staffed by eight signalmen, one controller and one announcer; the panel can be controlled by two signalmen at quiet times by keying control desks, into the two positions in use. 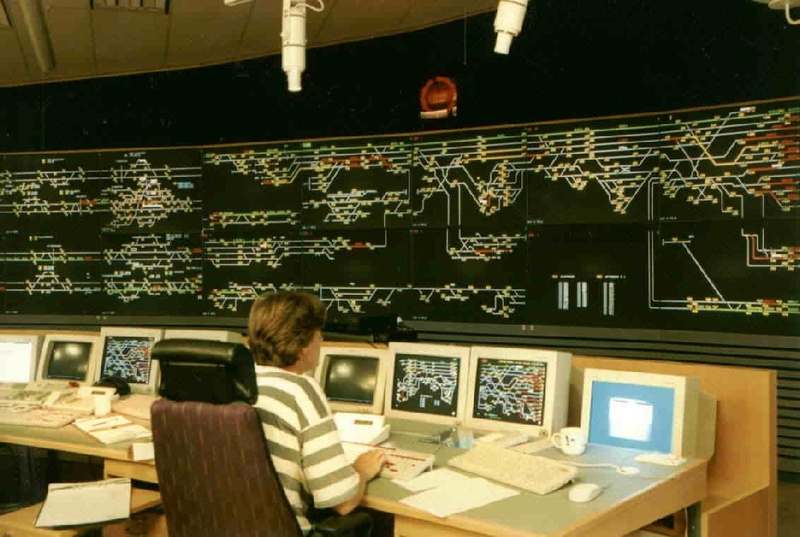 The control desks are arranged in three tiers with signalmen on the lower level, power controllers and announcer in the centre and the control manager on the upper level. During our visit many questions were asked about the operation of the centre and signalling related items, including the system of automatic train control used in Sweden. This was explained in some detail including how portable beacons are used for P.Way checks and other purposes. At the end of our tour we thanked our hosts and made our way back to the Hotel Eggers. As three of our members had to depart for home early on the Friday evening, it was agreed by everyone that we should have dinner together this evening in the Hotel Egger's restaurant, so at 19.30 our party sat down for what was to be a long and pleasant evening in friendly company, a few words being said by the chairman after dinner. Friday morning was available for any last minute sightseeing or shopping before our lecture on the X2000 project. This for me was the first occasion I had had to walk around Gothenburg alone and to take some photos of the town, in vain it turned out as I discovered the film in my camera had not rolled on. At 12.30 pm the party reassembled in the hotel reception before the short walk to the Hotel Scandic Crown, where we were met by Mr Mats Karlsson who would be giving the lecture on the X2000 project. This lecture was to last for two hours and went into great detail about the circumstances that led up to the introduction of the X2000 and the technical side of these units. Following the lecture most of the party returned to the hotel reception, some going to their rooms to prepare for the start of our return journey on Saturday whilst a large group decided to seek refreshment before the evening meal. In all this confusion it was overlooked that three members had to depart at 18.00, and as a result proper farewells were not made. We departed the Hotel Eggers for the last time at 08.30 in order to catch our train, the 08.55, for the start of the journey home. This journey however was to be made in two stages with a break of seven hours or so in Copenhagen. The return route was the same as that taken on the outward journey and does not need any further description as such but a few highlights should be mentioned. At Helsingborg we boarded the ferry by foot, and being Saturday foot traffic was very busy with people headed for cheaper shopping in Denmark. 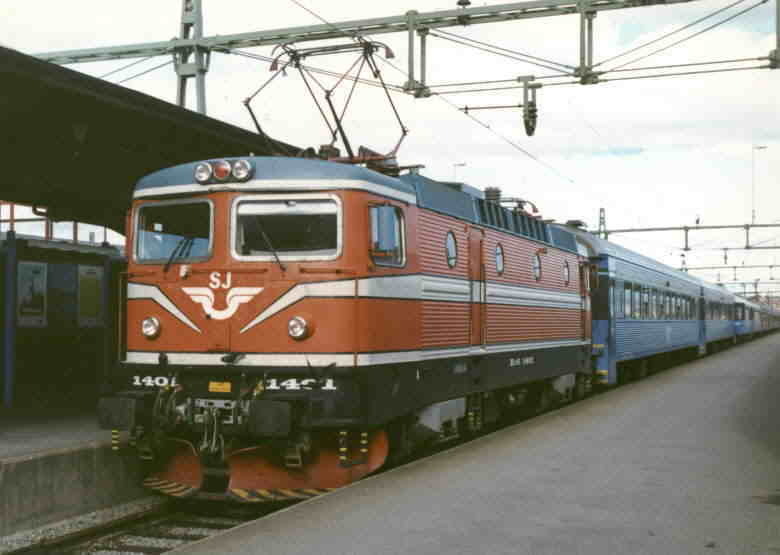 Our train from Helsingor was a stopping service and was made up of a push pull set and electric loco No. 3017 leading. The slower journey to Copenhagen allowed us to see the surrounding countryside at a more leisurely pace and not seen a week ago was a small roundhouse with a tank engine in steam stood outside, along with some vintage coaching stock, it was assumed that this was a small local museum. On arrival in Copenhagen our luggage was stowed away until our evening departure, and members duly went their own way to explore Copenhagen. A group of us remained at the station with one of our German members who would be departing for home at 15.20, in doing this we missed two other German members who would be leaving at 19.05. After bidding farewell to our German friend we walked down to the canal side in search of a boat ride, for an easy, but slightly damp water-born sightseeing tour. The tour took in such sights as a naval college, royal and government buildings and of course the little mermaid. On the return leg of the tour we encountered a very large ferry, at least it looked very large from where we sat and as it bore down on us. Shortly after this little incident we turned into a branch in the canal, much of the way along this branch was lined with yachts and barges of all ages and in various states of repair. At the end of this branch our craft had to pass under a very low and narrow bridge and then turn 90 in its own length in order to continue along the main canal back to the starting point. The remaining time was spent in seeing the sights during a stroll back to the station, our train for Brussels departing at 21.05. It was a pleasant surprise to find that we had the same couchette conductor as on our outward journey; we had got on well with him on the outward journey, having taken time to talk about his hobby of collecting old Dinkey toys. The journey back to London was in the main uneventful. In Germany on Sunday morning a steam locomotive was seen and at Aachen one of DB's preserved E class electric locomotives. Our journey on the Eurostar started out well enough but at Lille Europe we were invaded by the passengers from a failed Paris-London train which made conditions on our train cramped to say the least and also led to a late arrival in Waterloo. Thus ended the Institution's 1996 visit to Sweden and our first continental tour via the Channel Tunnel. I would like to thank Peter Lindop who provided me with a map of our route and who like me must have been awake at Puttgarden and Rodby during the wee small hours.